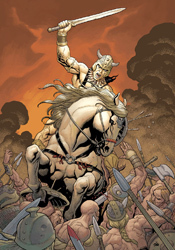 With the conclusion of Dark Horse’s first Conan series after issue #50 earlier this year, Conan the Cimmerian takes up the mantle as the publisher’s new ongoing series for the legendary character. For the pop culture challenged, Conan is a legendary wanderer, a reaver who walks the land with sword in tow, ready, willing and able to throw down should the opportunity present itself. There’s really little else in the way of back story here – all you need to know is Conan is here, he knows his way around a battleground, and you should probably get out of his way if he looks at you funny. One of my biggest problems with period pieces set in the dark ages, such as this one, is the tireless Olde English that usually goes hand in hand with both the narration and the dialog. I’ve never been much for an excess of “thous” and “arts,” and find that such strict dedication to an older way of writing does nothing but test my patience. Mercifully, that’s an opinion that Cimmerian author Timothy Truman seems to share. In his script, Conan’s players speak in a much more familiar, conversational style. They aren’t dictating prim and proper literary masterpieces with each statement, and that makes actually hearing what they have to say much, much easier. Naturally, he’ll still slip in a period-specific phrase or two to remind his readers of where and when the story takes place, but he’s not bluntly beating them over the head with it in every single word balloon. Truman seems to have a good handle on what you’d expect from an issue of Conan, too. He doesn’t waste a lot of time with back stories or personality quirks when everybody knows that most of these new faces will probably be cut in half before the issue’s through. He gives us the barest of introductions; just enough to differentiate one face from another, and then throws us right into battle. The issue has just enough depth to feel like it means something, and more than enough action to satiate your hunger for swordplay. Tomas Giorello and Richard Corben team to bring some outstanding original artwork to the classic character. The rough, grainy texture that fills most of Giorello’s work provides a rich, warm quality to both the characters and the surrounding landscapes. His layouts seem to float between the sharp edges and stark contrast of fully inked artwork and the more lush, free-flowing nature of the original pencils. Perhaps most impressively, Giorello’s work is delivered with a conscious limitation of detail. That focus on storytelling and simplicity without sacrificing quality immediately reminded me of the Kubert family. His work carries their same knack for strong characterization, easy legibility and flowing motion, all the while resisting the urge to become lost in an excess of detail. It’s just right. Corben’s artwork isn’t quite as good, but still follows many of those same guidelines. Its detail is kept in check, and the artist’s similar focus on fine storytelling and easy legibility makes the transition between styles an easy one. Corben’s work lacks the sensitive touch that Giorello brings to the table, but his hard edges and dense pointillism provide an excellent counterpoint. I wasn’t expecting much here, since I’ve traditionally had little time for the character, so I was surprised to find that the series is actually pretty entertaining. It avoids many of the stereotypical pitfalls that had led me to write the character off in the first place, and while it isn’t the most involved book I’ve read all month, it’s not meant to be. Conan brings a fine mix of adventure and action, and has never been easier to pick up and read. Borrow it and keep an eye on it going forward.